A compliance firm for independent investment advisors offering compliance support and administrative solutions. At RIA Registrar, LLC, we create strategic partnerships to provide compliance and administration solutions that enable you to operate in good standing. We help your business understand the language of compliance and work relentlessly to make sure your company is ready to be an independent RIA. Our high-quality services allow you to concentrate on taking care of clients while helping to ensure you are not in violation of any regulations. 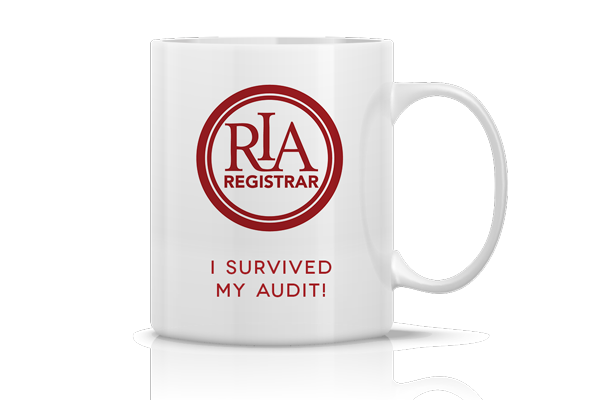 RIA Registrar is a compliance consulting firm for independent registered investment advisors (RIA). Our services include state and SEC registration, ongoing compliance maintenance, and errors and omissions insurance coverage. As a fiduciary, you are held to a high standard of conduct: you must protect your clients’ best interests, give sound investment advice, and comply with SEC and state regulations. We provide turnkey solutions that satisfy the needs of RIAs through all stages of growth. 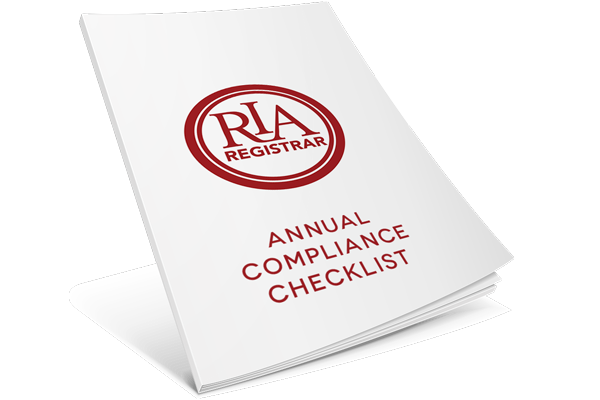 At RIA Registrar, we help you implement numerous ongoing compliance solutions. We provide turnkey solutions to register your advisory firm with either the state or SEC. For many, the registration process can be overwhelming because filing requirements vary by state. Failure to disclose conflicts or failure to comply can be damaging to your advisory practice and may have lasting negative effects. Successfully navigating the registration process requires time, significant industry knowledge and great attention to detail – all of which we can provide. We use the Web IARD/CRD, a system sponsored by the North American Securities Administrators, to electronically file critical application documents on behalf of your firm. Our state and SEC registration services include Form ADV 2, Form U4, Form ADV Part I, IARD Service Bureau, Incorporation (LLC, S Corp, etc.) and other RIA required documents. Through our RIA Maintenance Program, we offer ongoing support and training to ensure your firm has the necessary tools to remain compliant with regulations. We understand your practice and recognize you need distinct features to support it. 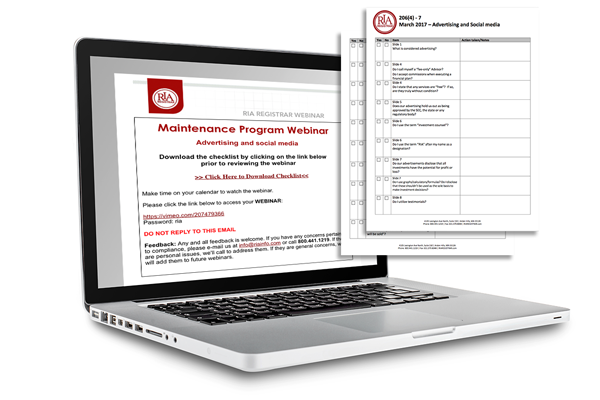 Monthly webinar training and corresponding checklist to document and review your supervisory procedures. Annual assessment checklist of your firm’s code of conduct and supervisory policies and procedures to document your findings and provide a written action plan to resolve deficiencies. 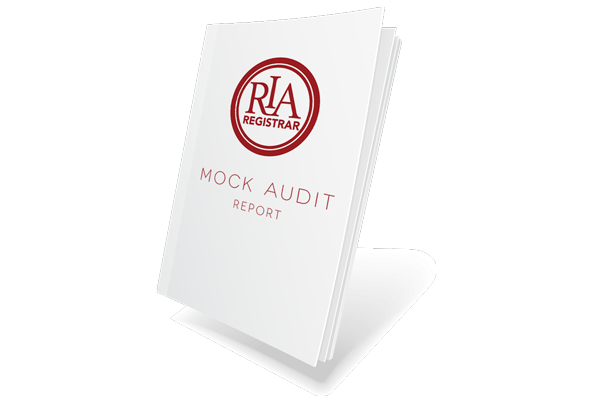 Conduct a mock SEC examination of your firm. We will visit your primary office for two days, conduct interviews of key personnel and principals, review a sampling of the documents likely to be requested by the SEC, and prepare a written report of our findings. On-site fees are in addition to assessed maintenance fees for affiliated RIA firms. Review the state/SEC required documents that are requested for an audit or state examination. We will provide you with a checklist of the necessary books and records requirements, serve as a resource during the audit/examination, and provide assistance to help satisfy any deficiencies.